According to the Center of Disease Control, roughly one-third of adults suffer from hypertension or high blood pressure. Abnormally high blood pressure has been shown to cause prevalent conditions such as congestive heart failure, heart disease, kidney disease, and stroke. People who are regularly experiencing hypertension need to make sure that their blood pressure is monitored daily. For those who would like to avoid bulky arm cuffs, you might prefer a wrist model. These types of devices perform the same functional as traditional blood pressure monitoring products, but a wrist blood pressure monitor secures to your wrist rather than your arm. Our extensive guide of the best wrist blood pressure monitors contains many portable, discrete, and comfortable options to accurately measure your blood pressure. Since its launch, the Omron 7 Series Wrist Blood Pressure Monitor has been strongly recommended by doctors and pharmacists throughout the world. These products have been tested and validated for accuracy, so you will never have to worry about receiving a false reading. By offering the user sufficient checks, sensors, and indicators, the device ensures that the cuff-fastening and monitoring process is operating properly so that the system can deliver the best results. Along with providing extremely accurate readings, the device is most known for its irregular heartbeat/movement detector, portable/slim design, revolutionary positioning system, advanced averaging, heart zone guidance, easy operation, excellent memory capacity, blood pressure level indicator bar, pulse reading, dual user mode, and auto-inflation. The Omron 7 Series Wrist Blood Pressure Monitor is sure to provide the perfect combination of accuracy, quickness, reliability, and comfort. The Omron 7 Series Wrist Blood Pressure Monitor is one of the easiest blood pressure devices to operate. After securing the device on your wrist, position your arm at heart level across your chest while holding your elbow firmly. The advanced positioning system should indicate if the cuff is in the correct alignment. In order to ensure that you receive the proper reading, keep the blood pressure monitor level with your heart. The product is equipped with blue and orange indicator lights to guide your wrist to the proper position. When your wrist is at heart level, the blue light will appear and the device will automatically start the reading. When an “E” system is displayed on the device, the blood pressure monitor could not detect a pulse wave. A double “E” indicates that the cuff is either over-inflated or under-inflated. The problem can be rectified by simply unfastening the cuff and shutting down the monitor. Wait a couple of minutes before attempting to obtain a proper reading. There are many features that contribute to the overal efficacy of the blood pressure monitor. The product’s accuracy is the result of innovative features such as the smart head guide technology, intelliSense technology, and the advanced positioning system. The on-2 mode of the advanced positioning system features a buzzer that will sound once if the position is correct and twice if the position is incorrect. The buzzer can be disabled for privacy. The irregular heartbeat detector is designed to alert you if your heart beat is 25 percent above or below the normal range. On the other hand, the average value calculator can automatically display the average of the last three readings that were taken within ten minutes. By pressing the “MEM” button, you will be able to view the exact date and time of each reading. The monitor’s blood pressure level indicator is another great reason to love the product. The blood pressure level indicator enables you to check if your blood pressure is within the normal range. The Omron 7 Series Wrist Blood Pressure Monitor can be used by two users since the product offers a guest mode. The guest mode is especially useful if you have family, friends, coworkers, or house guests who would like to use the device. When the monitor is in guest mode, your personal readings will not be affected. The product’s memory capacity is also appreciated by many users. The monitor can store a maximum of 200 readings. Because the product can support two users, a maximum of 100 reading can be stored for each person. The stored readings can be deleted by pressing the “start/stop” button while holding the “MEM” button. Since the product features a compact and lightweight design, the blood pressure monitor can be used at home, work, school, or anywhere else. Simply place the item in a small storage case, and carry the product to any destination. The product’s silent inflation enables users to discretely obtain their blood pressure in most locations. The product has a auto switch off feature to conserve the battery consumption. The monitor’s low battery indicator will let you know when the batteries need to be changed. Make sure that you replace both the batteries at the same time. The Omron 7 Series Wrist Blood Pressure Monitor is sold in a red box that contains a storage case, instruction manual, quick start guide, and 2 AAA batteries. The company also offers a comprehensive five-year warranty that covers repair services and parts. The batteries are expected to last about 400 uses, and the approximate life of the blood pressure monitor is well over two years. For over 40 years, Omron has been successfully developing blood pressure monitors to encourage people worldwide to manage their health in the comfort of their home. The company’s profound determination has resulted in 100 million units sold worldwide. 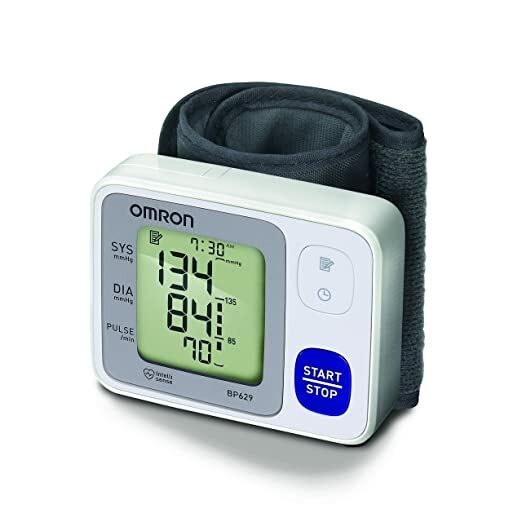 Because the monitor has been clinically validated, your medical team can rest assured that the Omron 7 Series Wrist Blood Pressure Monitor exceeds the standards of accuracy and reliability that are set by three major standards developing organizations. The product may reduce your number of checkups with the doctor and help you maintain a healthy heart. The Omron 7 Series Wrist Blood Pressure Monitor is suitable for wrists that are sized 5 1/4 inches to 8 1/2 inches in circumference. Known for its portable and convenient design, the Omron 3 Series Wrist Blood Pressure Monitor is the perfect product for those who would like to check their blood pressure at any location. 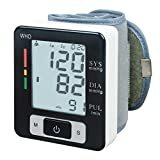 As an entry level device, the monitor contains just the right amount of features for people who are interested in simply obtaining an accurate blood pressure reading. 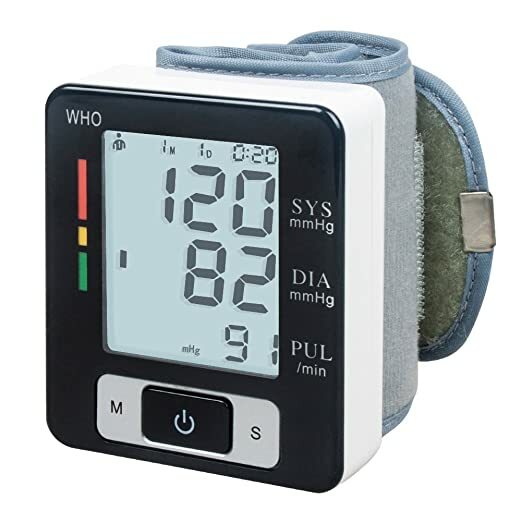 Many customers would agree that the Omron 3 Series Blood Pressure Monitor is one of the most affordable and practical medical devices that is currently available in a variety of stores. 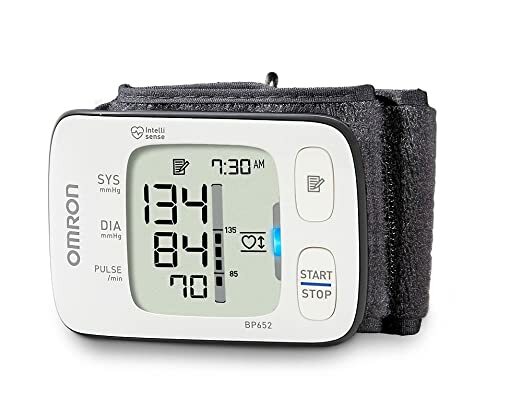 The features of the Omron 3 Series Wrist Blood Pressure Monitor include an advanced averaging technology, irregular heartbeat detector, blood pressure level indicator, and memory storage. The advanced averaging technology can display the average of the last three readings that were taken within the past ten minutes. The irregular heartbeat detector alerts the user when there are fluctuations or abnormal heart beats. When irregularities in your heart beat occur, you should seek medical attention immediately. The blood pressure level indicator is designed to compare your reading against the standard blood pressure guidelines that were established by the International Organization. The product’s generous memory storage enables users to store a maximum of 60 readings on the medical device. The readings can be reviewed with the simple touch of a button. Some additional highlights of the product are its accuracy, fitting, and ease of use. All Omron blood pressure monitors are clinically tested for accuracy to ensure that users will always receive the proper reading. The cuff of the wrist blood pressure monitor can fit those who have a wrist size between 5 1/4 inches and 8 1/2 inches; therefore, the product is suitable for most people. The monitor’s slim and portable design enables users to measure their blood pressure at their convenience. The Omron 3 Series Wrist Blood Pressure Monitor is sold complete with storage case, quick start guide, English/Spanish instruction manual, and two AAA batteries. A two-year warranty is also included with every purchase. Developed for the medical field and home use, the KEDSUM Wrist Digital Blood Pressure Monitors is one of the only products on the market that is equipped with a blood pressure level color indicator that adheres to the standards of WHO classification. The product is most known for its easy-to-read screen, irregular heartbeat detection, pulse rate indicator, slim/discreet design, generous memory storage, blood pressure level color indicator, storage box, and much more. If you are searching for a reliable and accurate medical device, consider purchasing the KEDSUM Wrist Digital Blood Pressure Monitor. After using the machine to measure your blood pressure, the product will readout and display the reading. The product most notable feature is the innovative LCD screen, which displays important information such as the measurements, date, and time. The last ninety readings can be reviewed by simply pressing a button. The size of the screen is 1.8 inches x 1.5 inches. The company provides users with many tips to promote optimal use of the monitor. Before operating the device, the product should be secured firmly to your wrist so that the cuff does not wiggle. Make sure that the cuff is not too tight or too lose. Once the product is strapped to your wrist, you should proceed to obtain a reading after resting comfortably in a char for about five to ten minutes. Try not to talk or move when the device is in operation. The blood pressure monitor should be used at the same time every day to ensure accuracy. The best time of the day to use the device is in the morning when you first wake up. For the best results, avoid using the device in extremely cold environments and while discharging urine. When you have been eating, exercising, smoking, drinking alcohol, or taking medications, the company urges users to wait at least thirty minutes before using the device to measure your blood pressure. The product is not recommended for people with arrhythmia. The monitor can accommodate a wrist that is between 5 1/4 inches and 8 1/2 inches in circumference. According to many online reviews, thousands of customers have truly enjoyed using the KEDSUM Wrist Digital Blood Pressure Monitor. Most users stated that they loved that the product can fit snugly on the wrist with minimal manual effort. Many customers also commented that they liked that the inside of the cuff is super soft and comfortable. While most consumers brought the product for primarily home use, a few nurses purchased the wrist blood pressure monitor for their job at a healthcare facility. Many of the nurses on the review site trusted the product to help them make a critical decision about a patient’s care. Most of the reviewers preferred the KEDSUM Wrist Digital Blood Pressure Monitor as opposed to a traditional blood pressure monitor with a cuff that wraps around the arm. After purchasing the KEDSUM Wrist Digital Blood Pressure Monitor, you will receive a storage box and two AAA alkaline batteries. The monitor’s compact and slim design enables users to carry the product anywhere. The product has a white base and a black display. The company Greater Good is committed to providing the best products to promote optimal health. 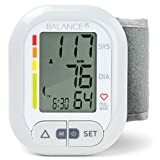 The Balance Wrist Blood Pressure Monitor is designed to help users conveniently monitor their blood pressure levels in the comfort of their home. Since the product is small in size, the monitor can be stored practically anywhere when the product is not in use. The Balance Wrist Blood Pressure Monitor is suitable for most adult users. the company has included high-precision sensors in the cuff. The monitor’s reliability and accuracy is one of the features that continues to attract many consumers. In addition, many customers enjoy the product’s easy-to-read display. The large screen with generously sized numbers can be viewed even in low light conditions. The dual user mode is also appreciate by most consumers. The dual user mode can store two users’ blood pressure readings. 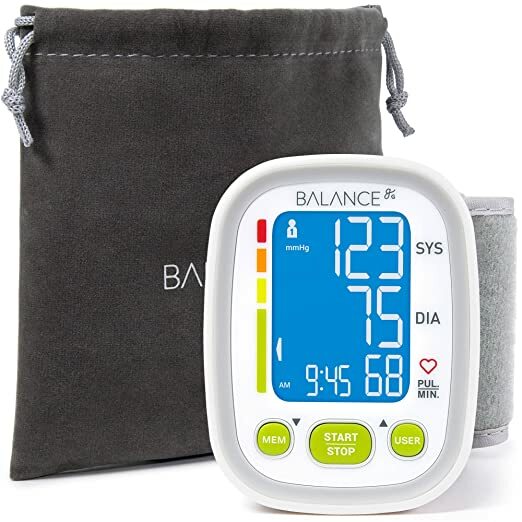 Greater Goods would like everyone to enjoy its products; therefore, the company is proud to offer a two-year warranty with the purchase of the Balance Wrist Blood Pressure Monitor. If you experience any problems with the device, the company’s friendly customer service team will be happy to help you. The warranty covers damages and defects. Because the product is a FDA-approved device, you can rest assured that you will receive reliable measurements with every use. The Balance Wrist Blood Pressure Monitor can be identified by searching for a monitor with an all-white display. The product can comfortable fit people with wrist circumferences between 13.5 centimeters and 21.5 centimeters. One of the most important components of a wrist blood pressure monitor is the ability to obtain accurate readings. A good wrist blood pressure monitor should have been independently tested and validated for accuracy and reliability. Make sure that you check the product’s packaging to verify that the monitor has received proper testing. There is a list of validated monitors on many reputable websites. Since most people purchase a wrist blood pressure monitor for its simplicity and convenience, they should be easier to use than traditional BP machines that wrap around your arm. Most models can be used by simply strapping the device on your arm. Once the product is secured, you can follow the directions on the display. The reading can be obtained by viewing the main screen. The systolic blood pressure will be displayed at the top and the diastolic at the base. After reading the numbers carefully, you can record the blood pressure on the device or on paper. The readings are typically shown in large and visible font, which is perfect for people with poor eyesight. In general, you may want to avoid models that are extremely difficult to use. The product’s instruction manual should be user-friendly. The most effective monitors will offer you the best value for your money. Many models are equipped with innovative features that can greatly contribute to the overall appeal of the product. An irregular heartbeat detection can identify abnormalities such as arrhythmias. A risk category indicator is designed to inform the user when the blood pressure is within a problematic range. A data-averaging function is a unique feature that can obtain an average from multiple readings. Some versions even offer a computer connection option so that the recorded readings can be downloaded to a computer. As you shop, make sure that you thoroughly consider your lifestyle. If you are constantly traveling, you may enjoy a lightweight blood pressure monitoring device that is easy to store on long trips. Models that contain a dual mode option may be great for those who maintain an extensive network of family, friends, and coworkers as the product will be able to store two readings. These types of products are usually available at drugstores, medical supply stores, grocery stores, and online. The monitors can typically range anywhere between $20 and $60 in price. Some insurance plans may provide coverage for certain models. You may want to review your insurance plan before shopping. You do not need a prescription to purchase one of these devices. Although a wrist blood pressure monitor can be purchased without a prescription, you should consider talking to your doctor about purchasing these products. An experienced physician will be able to evaluate the product for accuracy and performance. Your doctor can even teach you proper techniques for using the monitor. The most important indicators for overall health is a person’s heart rate and blood pressure. When these health indicators are poor, you may suffer from heart-related medical conditions. A wrist blood pressure monitor can ensure that your heart rate and blood pressure remain at optimal levels. As you shop for these types of medical devices, remember to check a product’s accuracy and reliability as you’ll want to ensure that the monitor always obtains proper blood pressure readings.